BMW is getting on the electric-car bandwagon with what may be the most stylish alternative-fuel vehicle to date. The Mini Cooper E plug-in is available in a limited rollout of 500 cars in New York, New Jersey, and California. 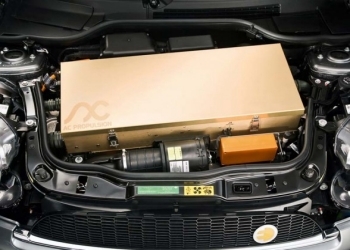 This is the German manufacturer's first foray into the alternative fuel world, competing directly with the Honda FCX, Chevy Volt, Tesla Roadster, and Toyota Prius plug-in. The MINI E features a 204-hp. motor propelling the car from zero to 62 mph in 8.5 seconds, with a top speed of 95 mph. The car has a range of 150 miles on a charge. The cars are not identical to their gas-powered counterparts because they have to haul a lithium-ion battery pack, which takes up so much room that the Mini E is forced to ditch the backseat. This extra gear also bumps the Mini E's weight to 3,230 pounds, up from a Mini Cooper's 2,568 pounds. The car will also come with a special charging adapter installed at an owner's home that recharges the Mini E in 2 1/2 hours. It also can plug into a standard wall socket, but will take longer to recharge. The electric Mini Coopers is leased to customers for one year with an option for an extension, the Munich-based automaker said in a statement. Potential customers can visit Minispace to get the latest news from BMW and sign up the test series. If the the MINI E is eventually sold, it would meet the same standards as the Chevy Volt for a maximum tax credit of $7,500. The field testing of the Mini E is part of BMW's "Project i", which will be followed in mid 2011 by a similar trial with the BMW Active E all-electric vehicle which will accommodate seats for four adults and cargo. The Active E is based on the BMW 1 Series Coupe and will be built based on the lessons learned from the Mini E field testing. The last phase of "Project i" is the development of the Mega City Vehicle (MCV) urban electric car, a new brand that will be sold separately from BMW or Mini, and is expected to go into mass production between 2013 and 2015. The field testing of the Active E will include fewer than 1000 cars and will be conducted in Los Angeles and New York, but BMW is also considering expansion to other areas. 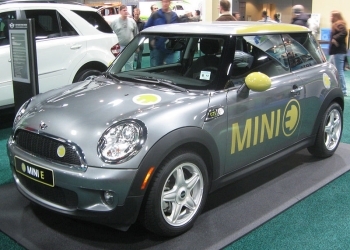 In the U.S. a total of 9,500 people signed up to lease the MINI E for the 450 cars available. In June 2009, Mini started the program by leasing 250 units in Los Angeles area and 200 in the New York/New Jersey area. The leasing price was set at US$850 (approx. €600) a month for one year and included collision coverage, maintenance costs, and home installation of the charging station. Residents of New Jersey did not pay sales tax on their lease due to the existing state exemption for battery electric vehicles. In May 2010 BMW announced that leasing could be renewed for another year at a lower price of US$600 a month. This renewal was offered to all individuals who currently have a Mini E but fleet customers are excluded, and according to BMW half of all current lessees agreed to the extension.